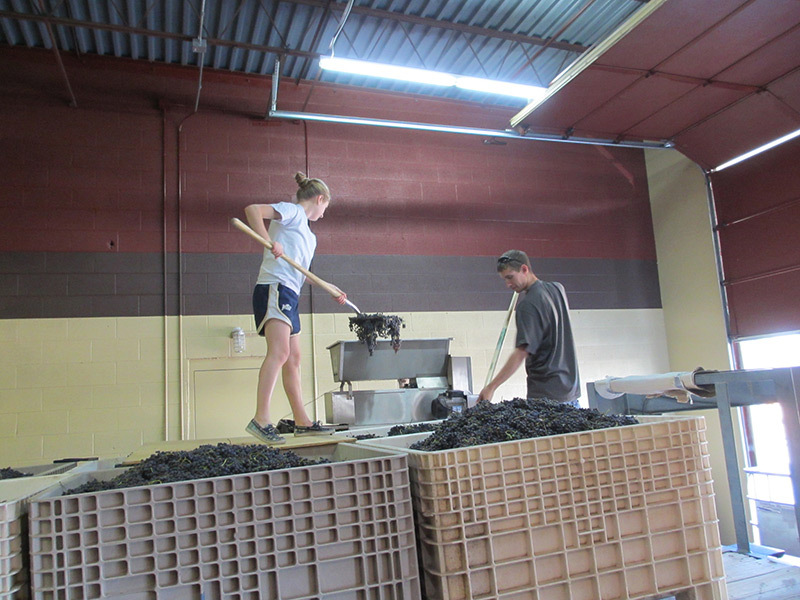 It’s 8:00 a.m. on a Saturday in mid fall, and things are buzzing inside Kingman Estates Winery. 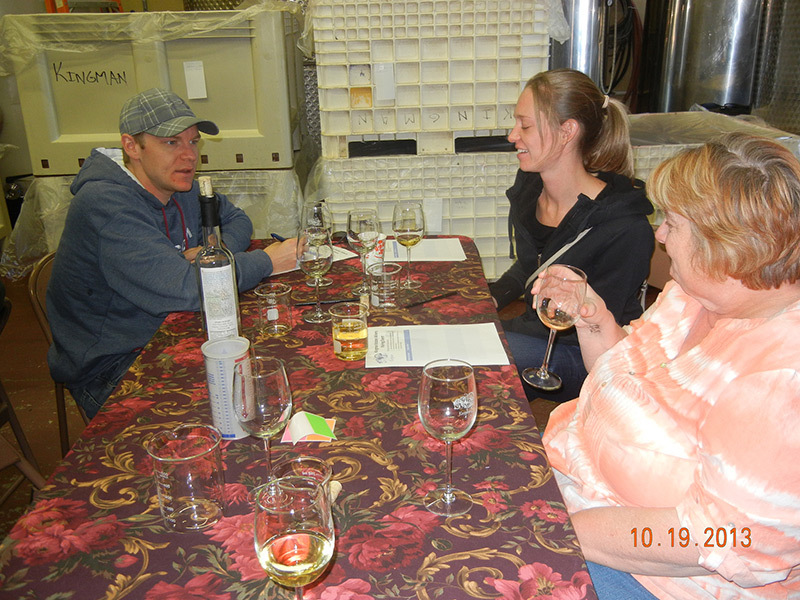 Doug and Karen Kingman have assembled a small crew to bottle a batch of Riesling wine that Doug vinified from the 2016 harvest. The crushed and pressed Riesling grapes were fermented and aged in a stainless steel tank at a controlled temperature. Known as “reductive” aging, maturation without oxygen in stainless steel – in contrast to wooden barrel or “oxidative” aging – allows the wine to preserve Riesling’s delicate aromas and flavors. 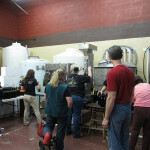 Our energetic crew, including Doug’s mother, Ginger, is primed for bottling. This is a family-run business at its heart. Have you ever wondered how a wine makes its way into the bottle? 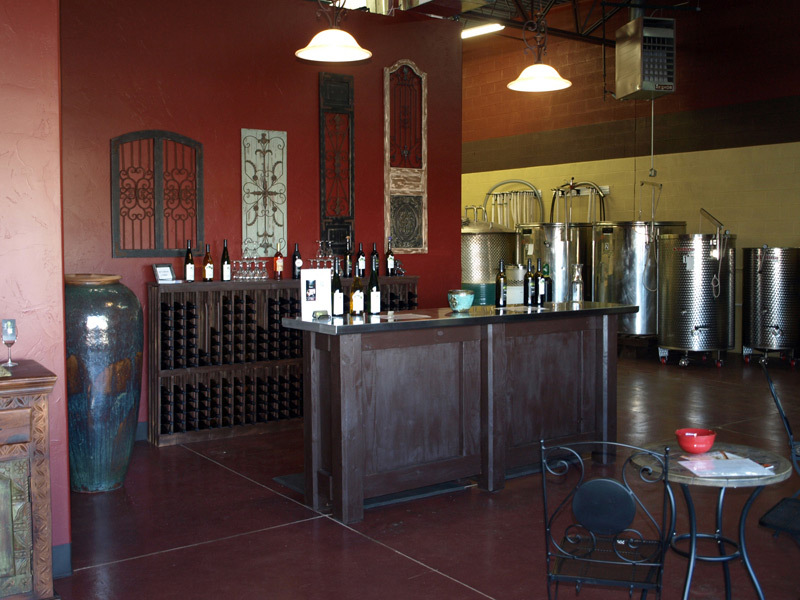 For industrial and larger wineries, the process is automated. 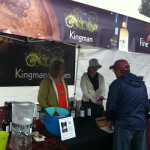 But for smaller wineries, such as Kingman, it’s all about keeping up with your coworkers. 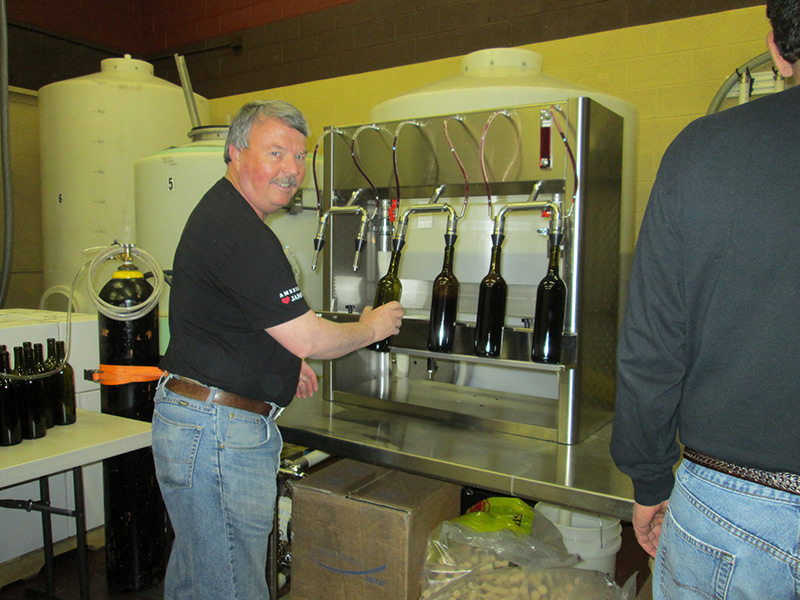 Before anything can happen, the bottling wine is first sterilized, including the hoses, bottle filler, corker, and the bottles themselves. The crew of five dons safety glasses, ear plugs, and gloves and takes their positions. Doug starts the diaphragm pump, which moves the Riesling from a vat to the filtration machine. The wine zig zags through a series of plates and then through a membrane filter, during which any particle larger than .45 microns is removed. A winemaker doesn’t have to filter a wine but the decision to do so normally rests on two factors: first, stabilizing the wine by removing any potential bacteria, and second, clarifying the wine to create an aesthetically pleasing final product. 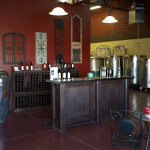 How much to filter is part of the winemaker’s art as excessive filtration can strip the wine of its aromas and flavors. 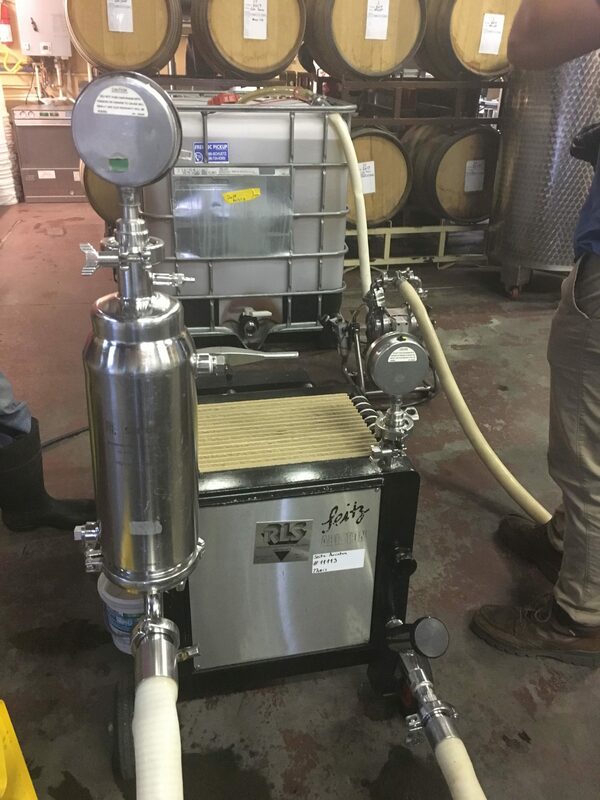 After filtration, the Riesling then travels to the filler machine, which resembles a milking machine at a dairy farm. At the filling machine, a crew member places a bottle under one of the six filler spouts. The heady pear aroma of the fermented Riesling wafts through the air as the machine fills the green bottles, calibrated to automatically stop at 750 ml. 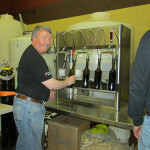 The next crew member quickly grabs the bottles and uses a foot valve to pop the cork into the bottle. Care is required to prevent corks entering sideways. 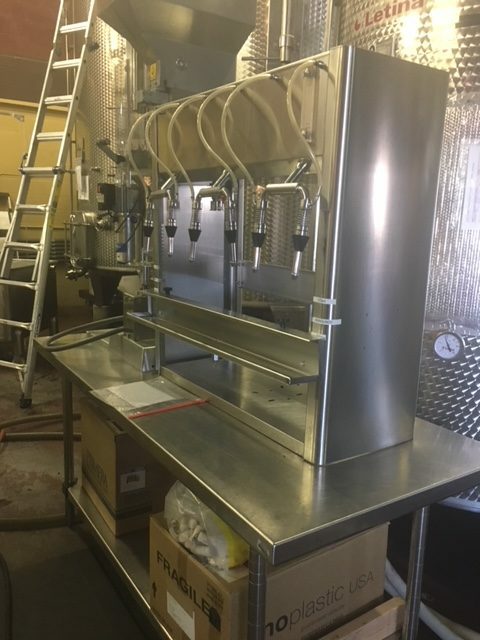 The corked wine is then handed off to the sealer, who places a capsule on top and hand cranks the capsule machine to seal each bottle – an upper body workout that allows you to skip the gym! 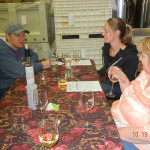 Karen Kingman wipes down the bottles to ensure they are completely dry before the next step – labeling. Doug’s mother, Ginger, carefully shepherds the bottles through the labeling machine and into the case box. 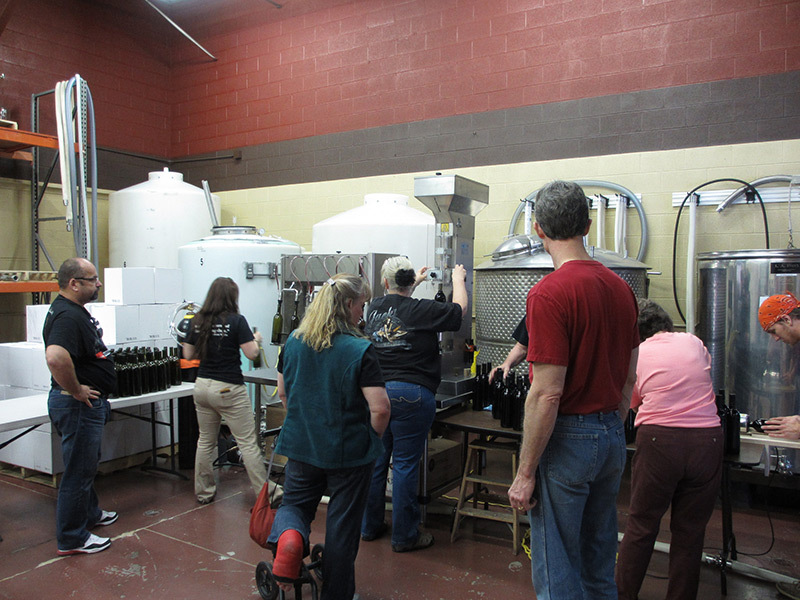 In under a few hours, our small but mighty crew has bottled 540 bottles of Riesling. Inside the bottle, the Riesling will continue to age reductively and produce its spellbinding magic. Its high acidity levels and intense fruit will allow it to age well, developing notes of honey and toast or perhaps smoke over time. 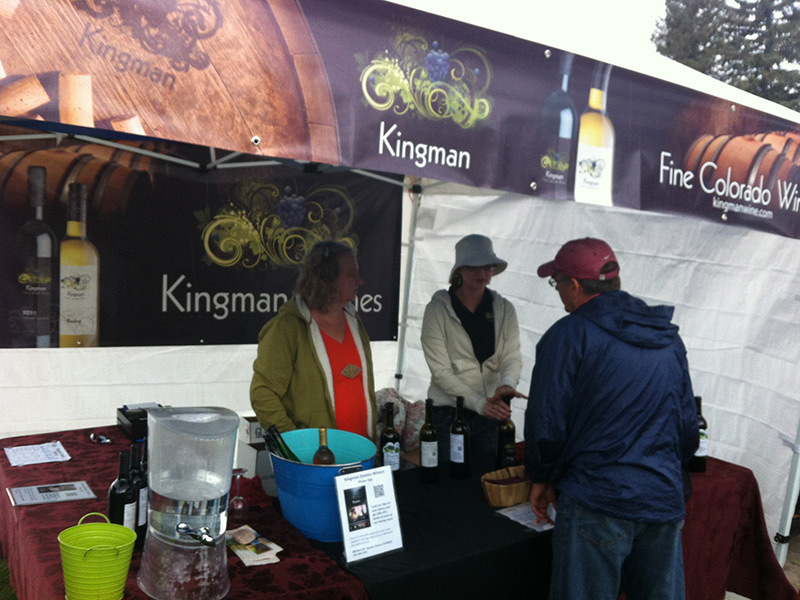 Which flavor notes will you taste when you open a bottle of Kingman Riesling 2016?